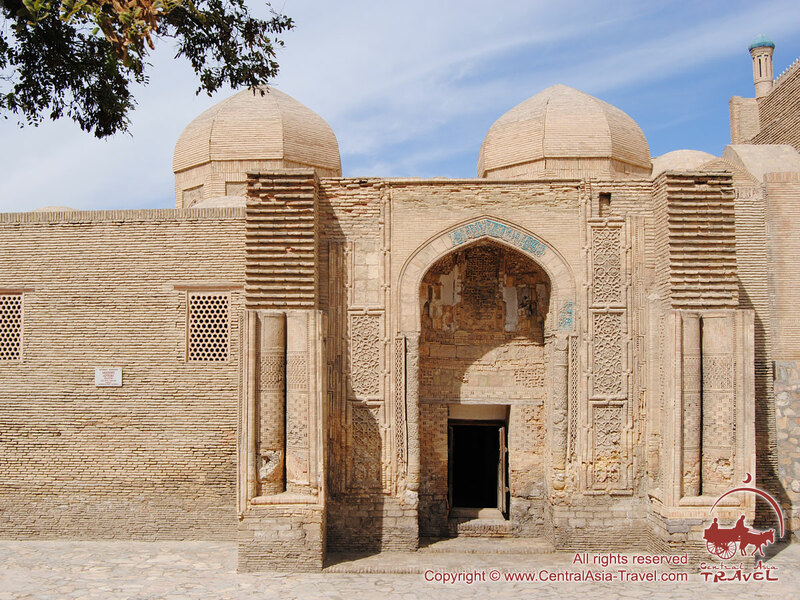 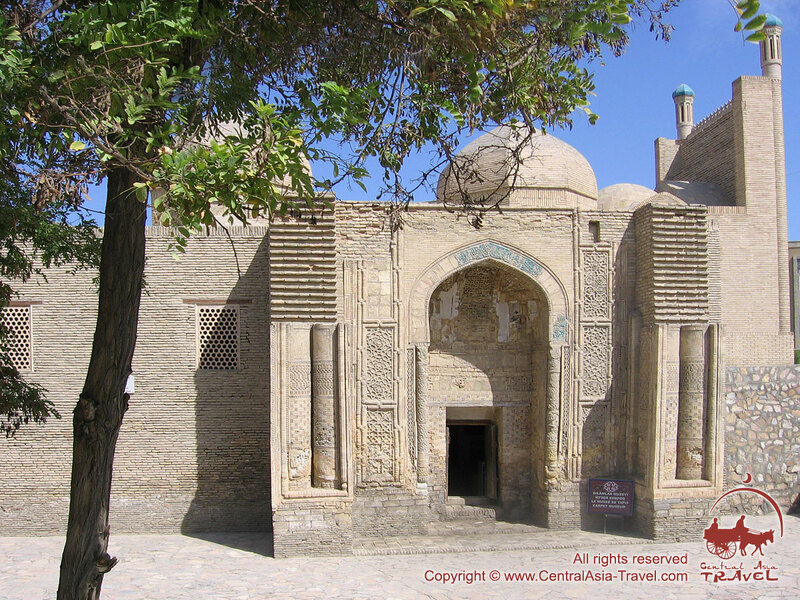 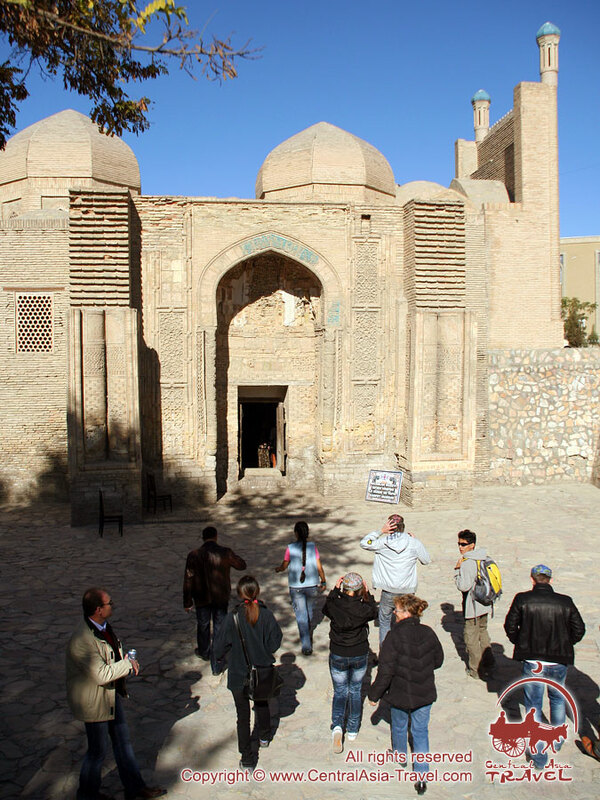 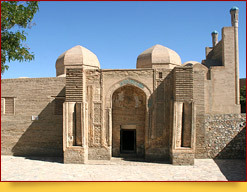 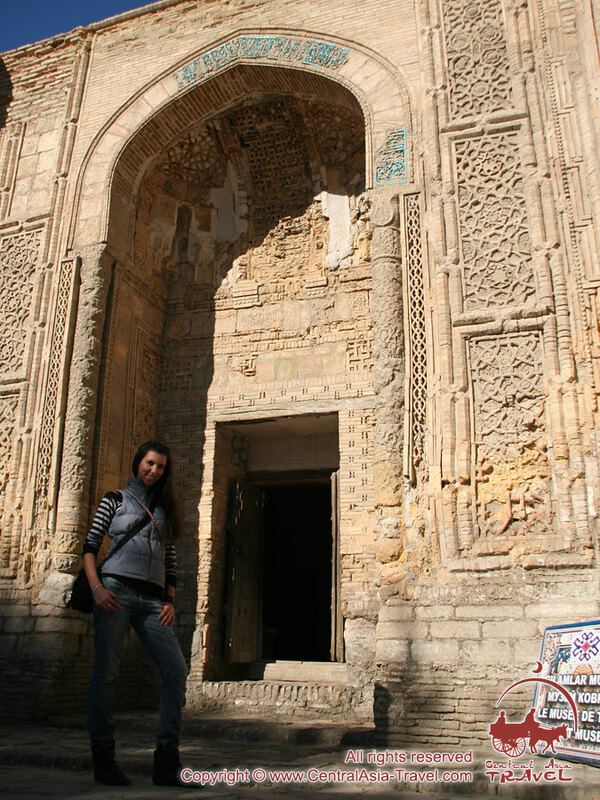 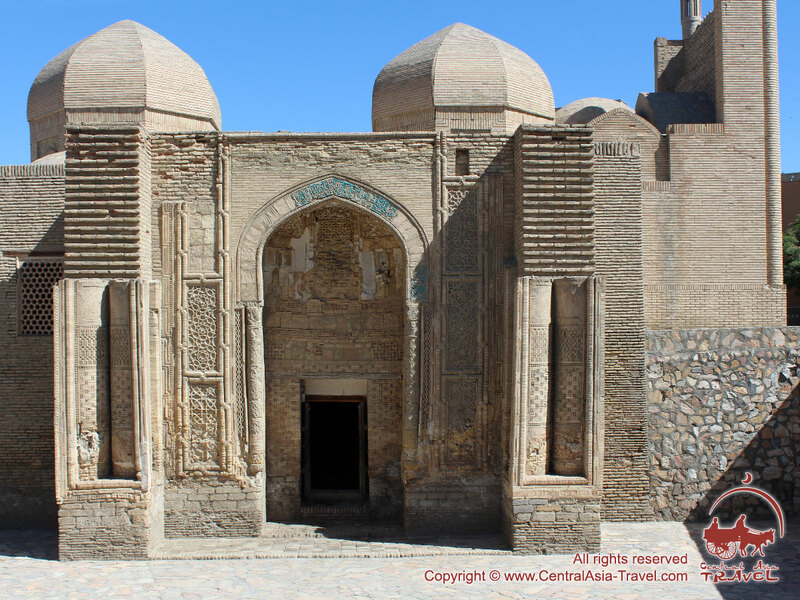 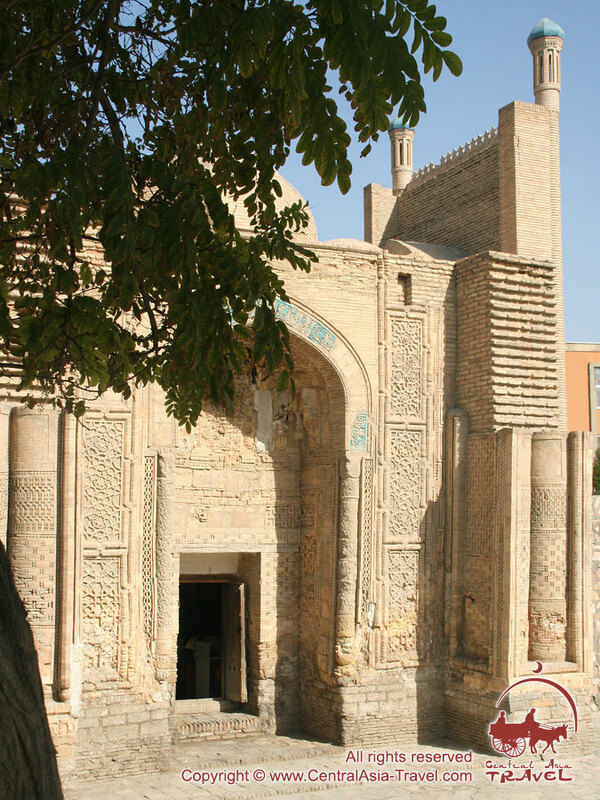 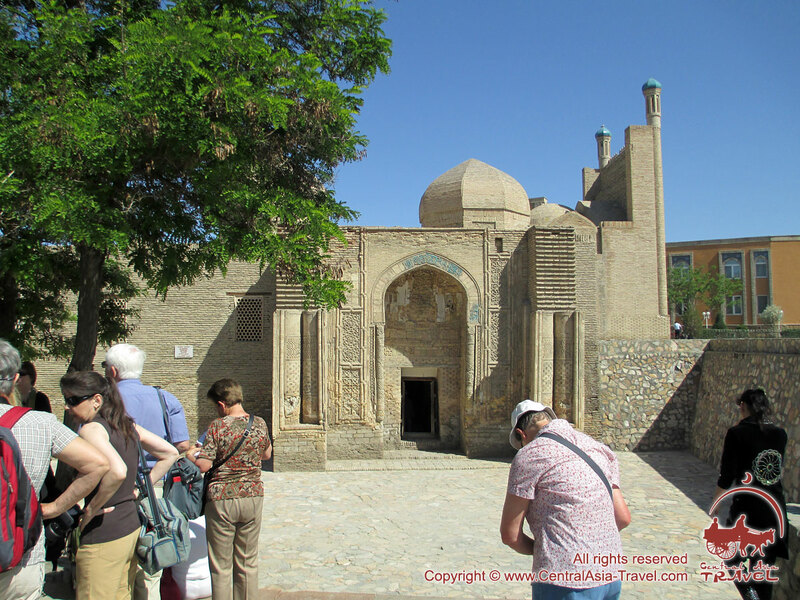 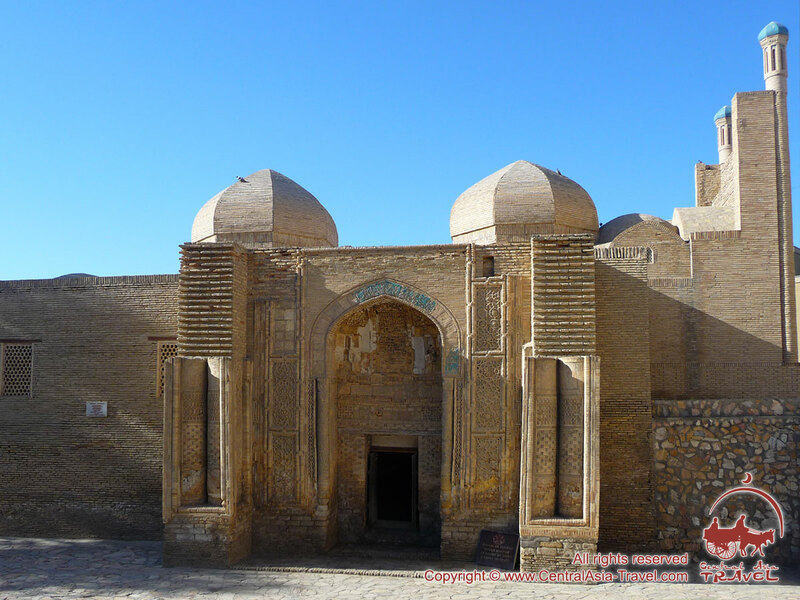 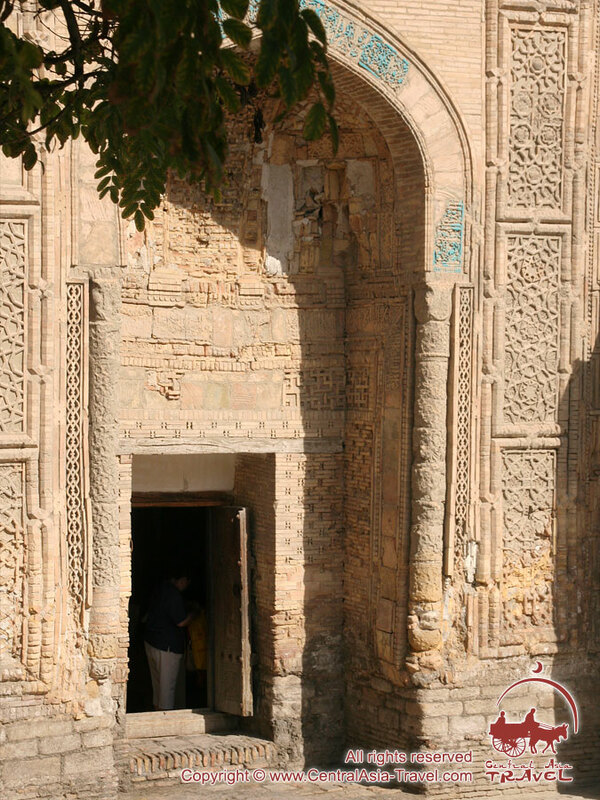 Magoki-Attori Mosque (‘a mosque in a pit’), located in the center of Bukhara, is one of the oldest city’s mosques. 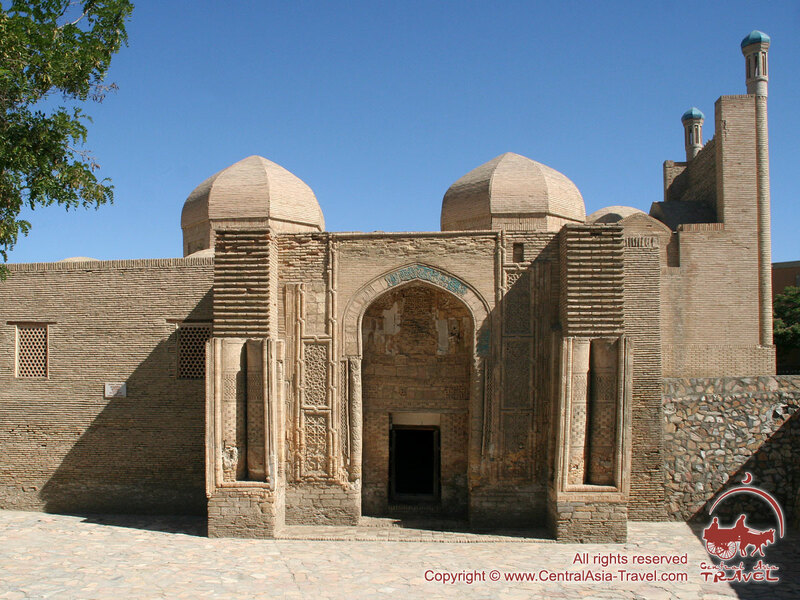 It dates back to 9th c. Early in the Common Era there was a fire temple with Lunar Bazaar where the mosque is now. 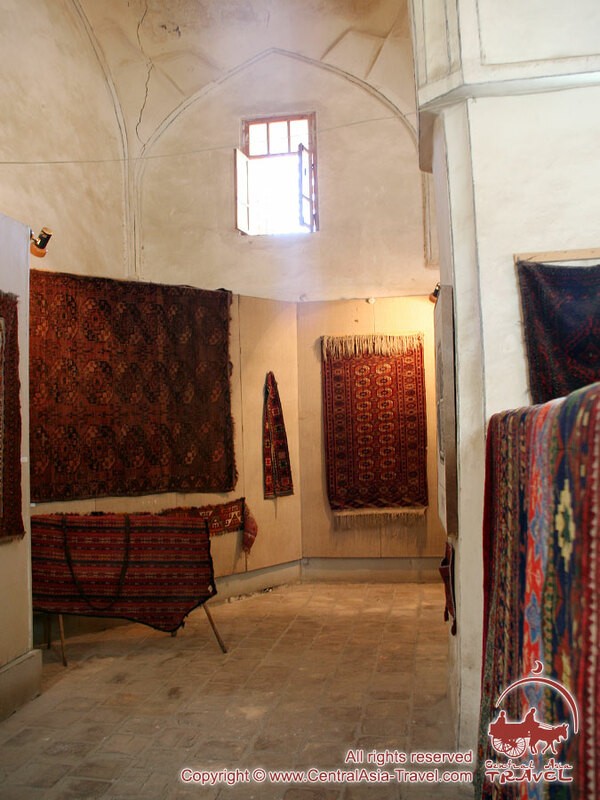 They sold spices and herbs at the bazaar, and figurines of Zoroastrian fertility deities during the Persian New Year holiday Nowruz. 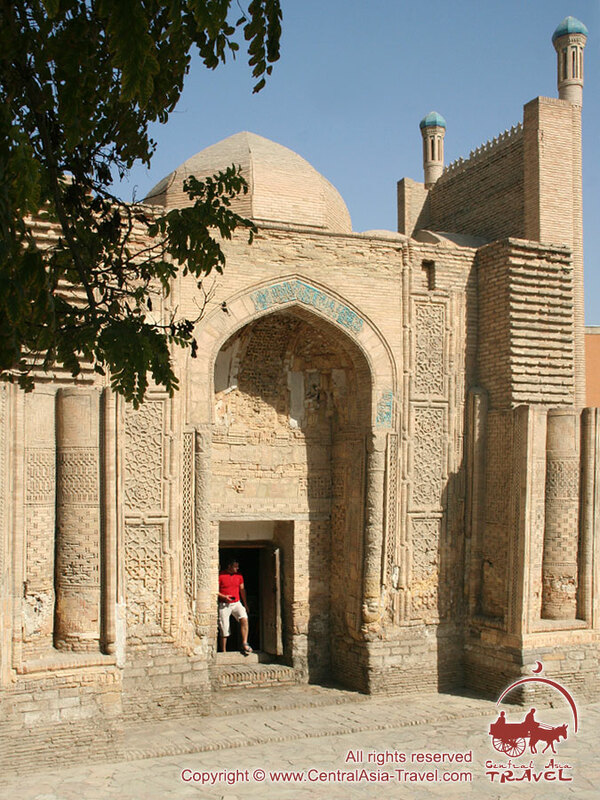 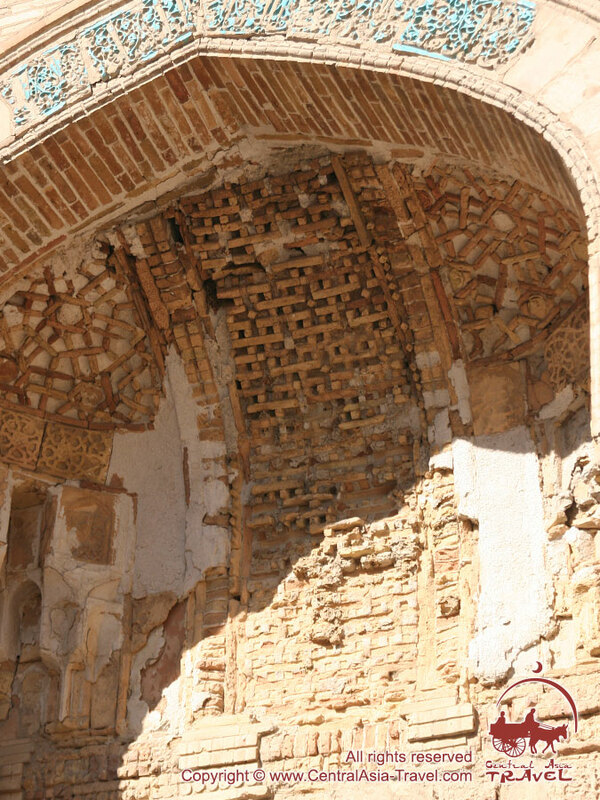 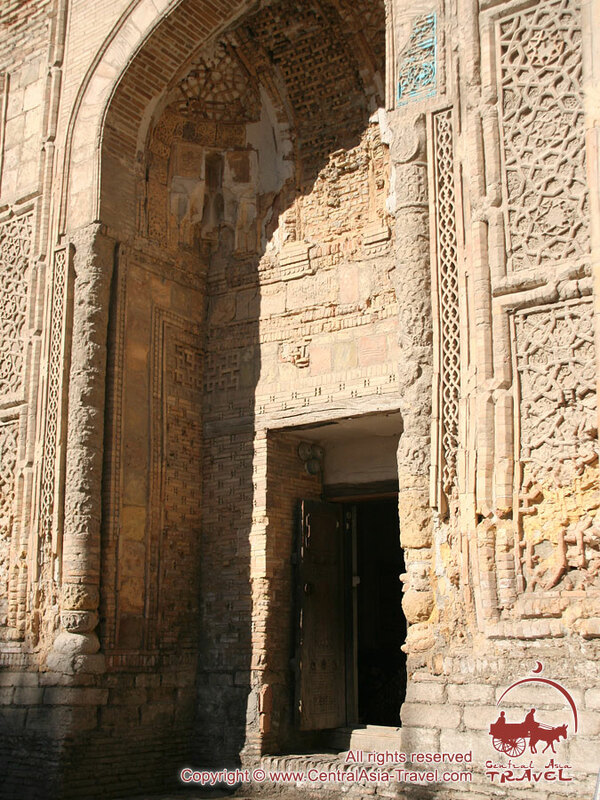 When Islam came to region, they destroyed the temple and built a mosque at the site of it. 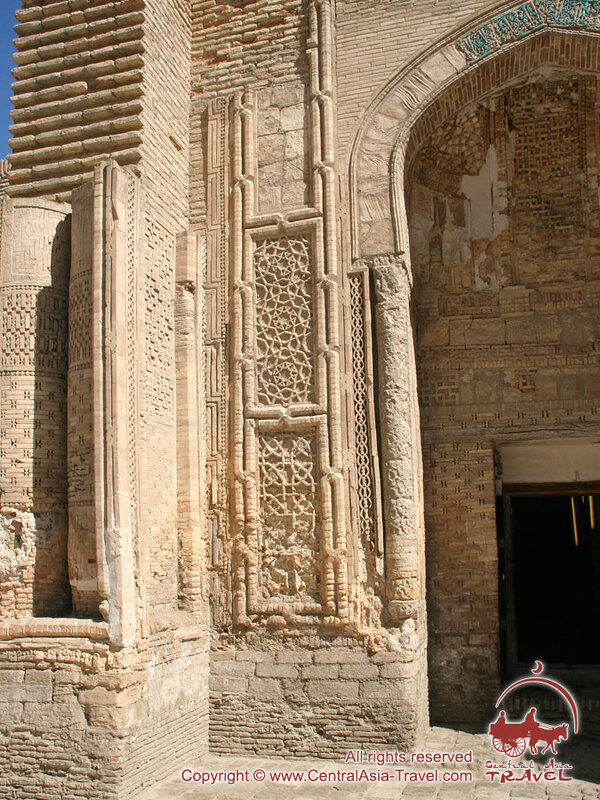 During archaeological excavations in the 20th c they determined that the first mosque was built at the site in the 9th c. They discovered the base of its walls and fragments of its stucco ornaments dating from the 10th c. At the end of the 10th с the mosque was destroyed by fire and a new mosque of the same design was built over it in the 12th c. It was destroyed in the 15th c except its magnificent south portal with unique monochrome decoration we can see today. 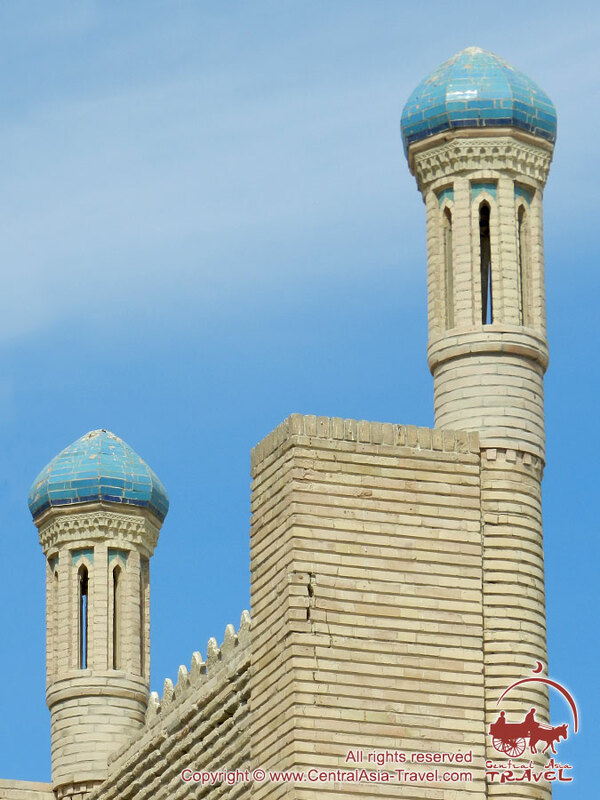 The mosque originally had 6 pillars and 12 domes. 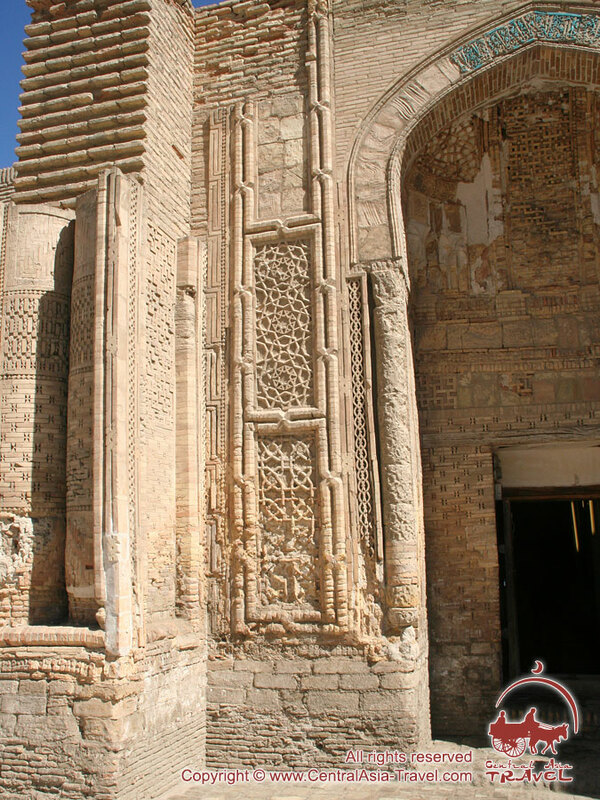 The main entrance had a portal with an arch on two pillars. 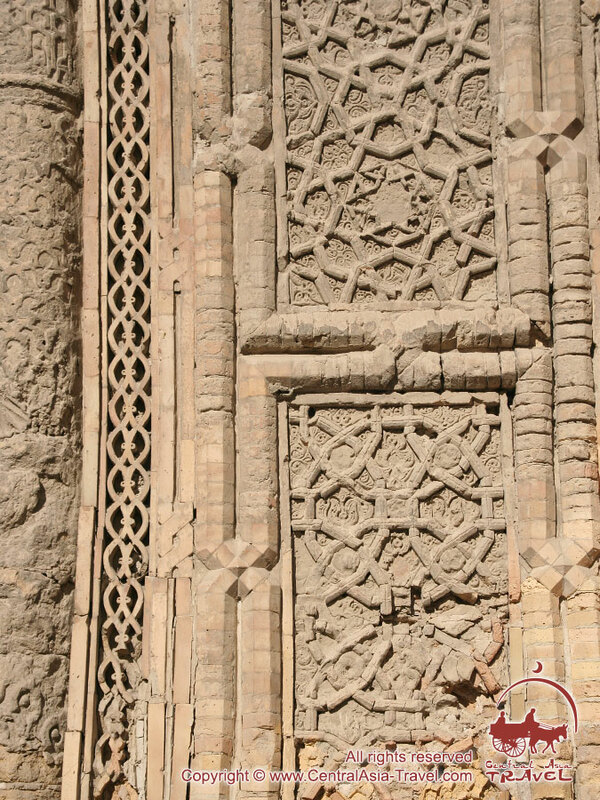 The material they used to decorate the building was polished and carved bricks. 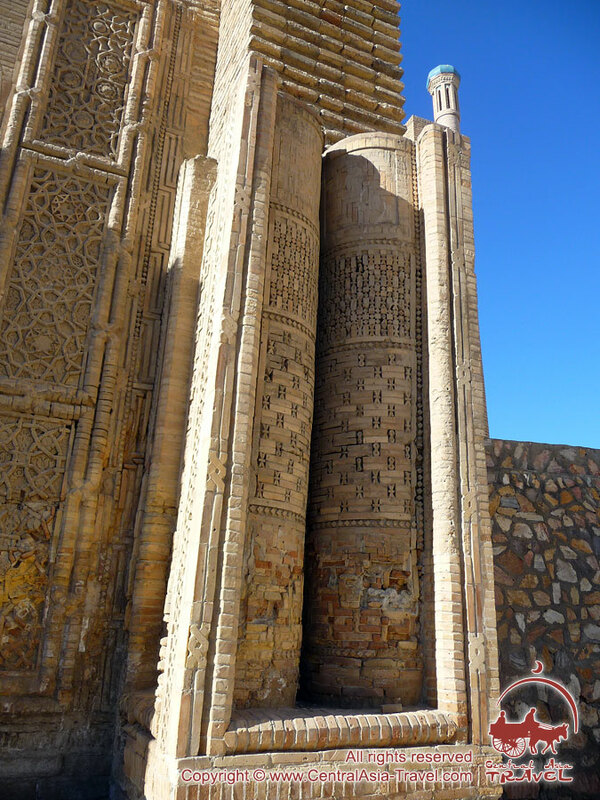 They made patterns in the form of curls, spirals and meanders with them. 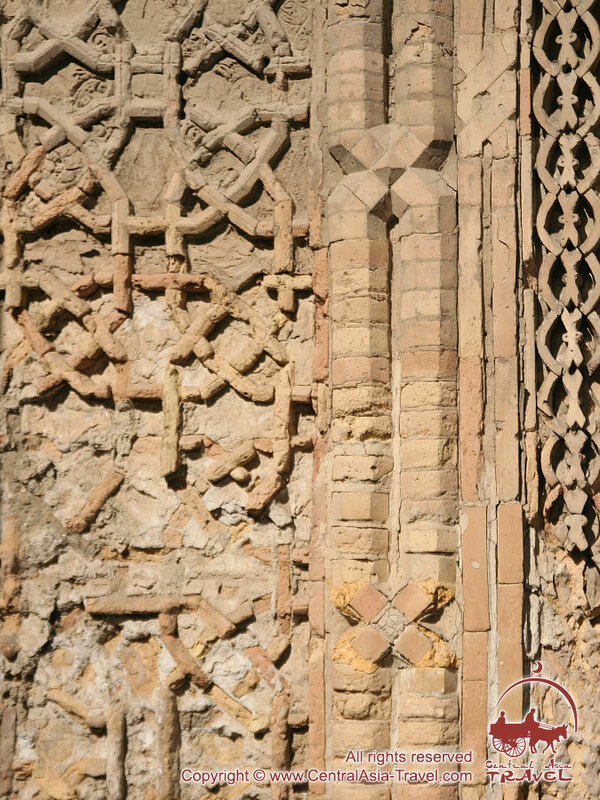 They also artfully combined bricks-bows with terracotta mosaics with glazed tile inserts. 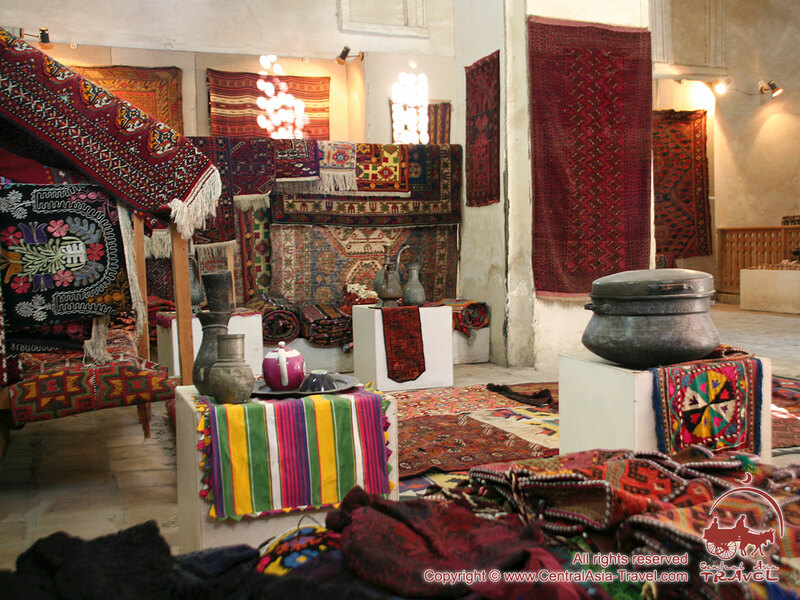 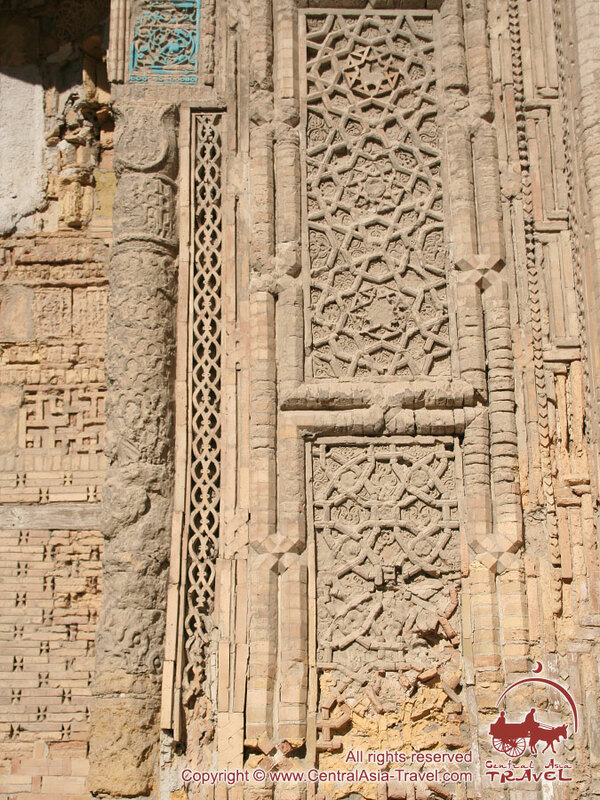 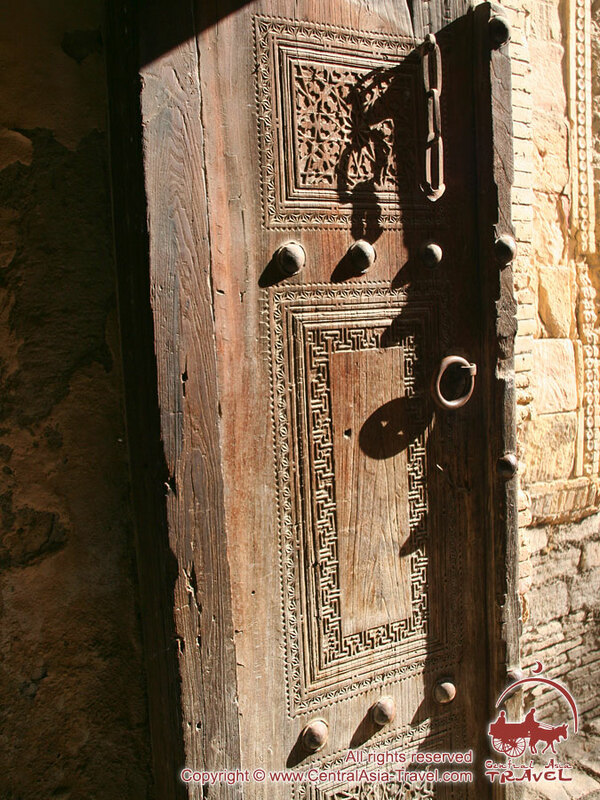 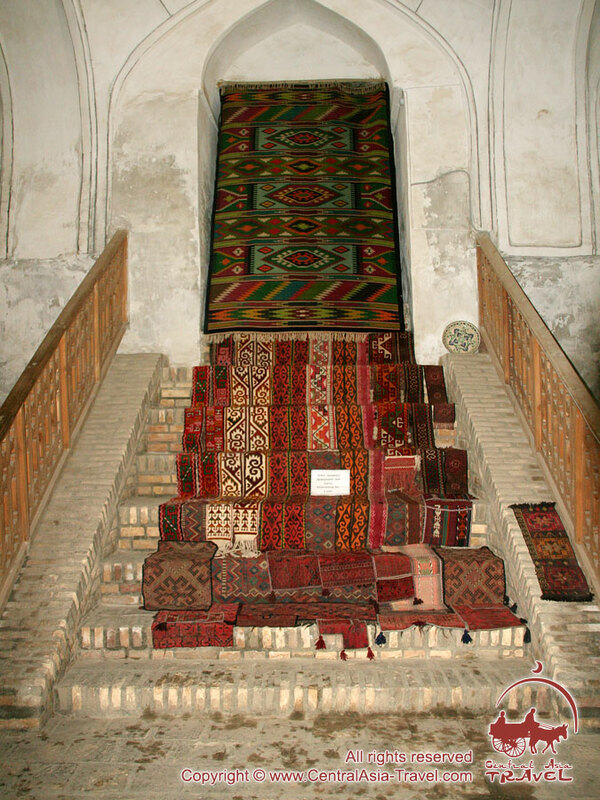 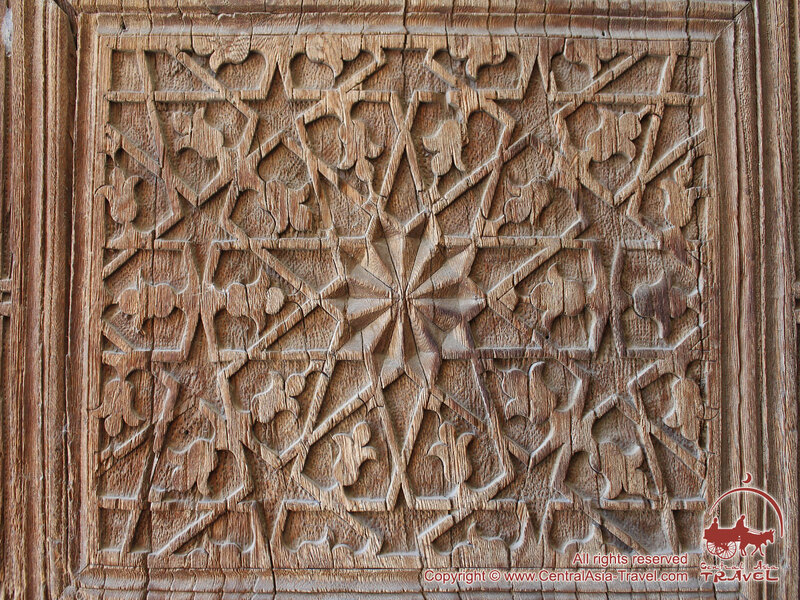 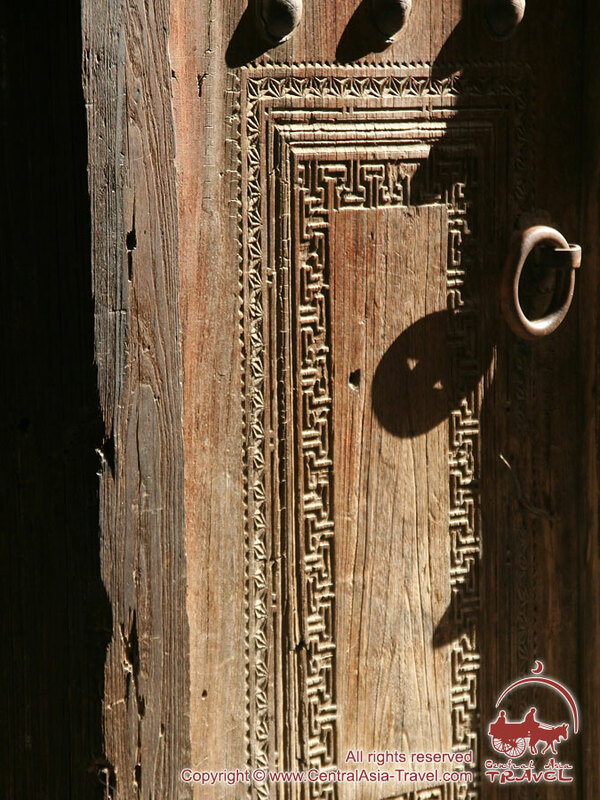 The vertical panels of moderate sizes have diagonal lines of inscriptions in Arabic and relief girih geometric designs. 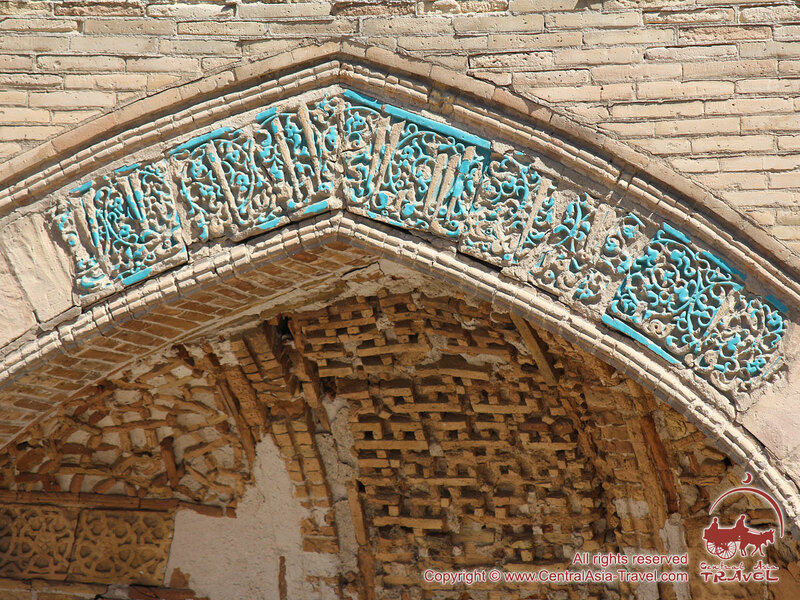 The original shapes and shadow tricks the brick patterns, as well as the ornamental splendor of the southern façade, prove amazing artistry and craftsmanship of Bukhara artisans in the 12th c.
The inscriptions on the new eastern portal say that the revival of mosque began in the 16th c. The portals of Magoki-Attori Mosque with their carved stucco ornaments, majolica, polished bricks and terracotta designs are masterpieces of Oriental architectural decoration and it is certainly worth seeing them.